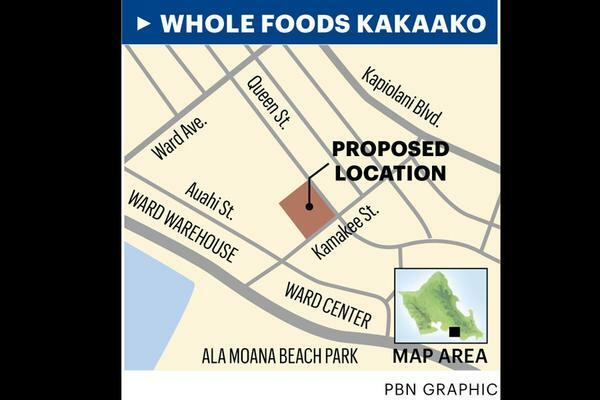 HONOLULU —The Howard Hughes Development Corporation unveiled its plans for the redevelopment of the Ward Warehouse shopping center. The company plans to erect two high-rise towers with 236 residential units and commercial space. Plans also call for open space, a recreational area and 548 parking stalls. The two story Ward Warehouse complex was built in 1975 and its redevelopment will displace a number of small businesses. 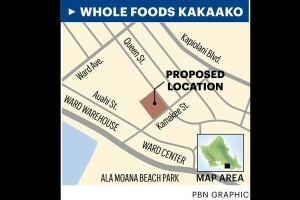 The transformation of the four-acre parcel will bring the most dramatic change to Kakaako. It’s being called the Ward Village Gateway. The Howard Hughes Development Corporation plan calls for two towers for a total of 236 residences, along with townhomes, two parking structures and commercial space. 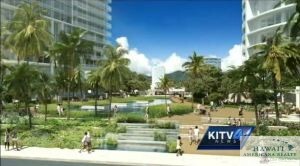 “This project is going to create a one-acre park connecting mauka to makai, Kewalo Harbor all the way to the planned rail stop at Ward Village. It’s going to create improved street scapes with wide sidewalks, bike lanes and new retail space along Auahi Street,” said Nick Vanderboom, Vice President of Development. It has begun meeting with tenants to see who can be relocated now. “We are working closely with our tenants about relocation possibilities. We have intentionally held space within Ward Center and we are already in talks with some of them to relocate within Ward Village,” said Vanderboom. It was during the presentation before the HCDA board that the company acknowledged it is considering adding a third tower but it’s not ready to say much about those plans just yet. “There may be a third on that parcel but that would be consistant with the master plan though,” said, Senior Vice President David Striph. The company isn’t also ready to say much about pricing of its units. It did however signal that construction of the two Gateway Towers will take place around the same time that it moves forward with the construction of another tower at the corner of Ward and Halekauwila streets. It was last year that the HCDA gave the green light for the more affordable reserve units project planned for the old Dixie Grill lot. The company has been exploring whether it can build affordable rentals instead of for sale units. Howard Hughes plans to ask for four modifications to the area rules for its Gateway tower project. It is asking the Hawaii Community Development Corporation to increase the building platform to 65 feet and to be given a break on the 15-foot setback requirement. A public hearing on the proposed changes will be held on Oct 2. Nick Vanderboom, senior vice president of development for the Howard Hughes Corp, show a model of the company’s plans to redevelop the 60 acres that is Ward Centers into a largely residential highrise community mixed with retail called Ward Village. The info center is slated to open by Friday, and includes an interactive scale model of Honolulu between Diamond Head and Sand Island, a small theater and historical exhibits created in conjunction with Bishop Museum that tell about the Ward property’s past back to pre-Western contact. A restaurant is also being built next to the info center, though an operator has yet to be selected. 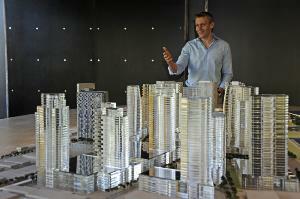 Sales of condo units in the project’s first two towers began last month by appointment. Model units are built out on the IBM Building’s sixth floor. HONOLULU–(BUSINESS WIRE)–Nov. 27, 2013– The Howard Hughes Corporation® (NYSE: HHC) announced today that Ward Village has received LEED® Neighborhood Development (LEED-ND) Platinum certification, making the Honolulu project the nation’s largest LEED-ND Platinum certified project and the only LEED-ND Platinum certified project in the state of Hawai‘i. The LEED rating system, developed by the U.S. Green Building Council, is the foremost program for buildings, homes and communities that are designed, constructed, maintained and operated for improved environmental and human health performance. LEED-ND Platinum certification was awarded to Ward Village based on achievement of the very highest standards of sustainable neighborhood design, including community-wide strategies such as pedestrian orientation and design; efficient land use in a location served by transit; water and energy efficiency; recycling and reuse of materials; indoor environmental quality; and parking and transportation programs that include vehicle and bicycle sharing. 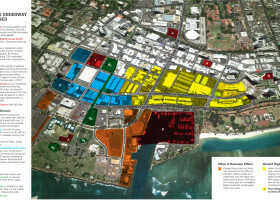 “Achieving the LEED-ND Pre-Certified Plan designation shows that Ward Village is committed to achieving a high level of sustainability from its early planning through its construction and ultimately operation as a thriving community,” said Rick Fedrizzi, President, CEO and Founding Chair, U.S. Green Building Council. 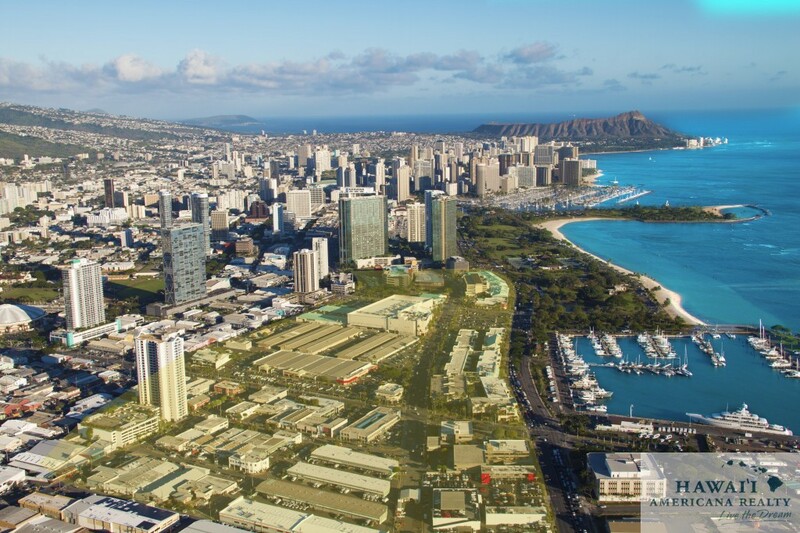 Over the next decade, The Howard Hughes Corporation will transform 60 acres in Honolulu into Ward Village, a vibrant master planned community encompassing 9.3 million total square feet. This mixed-use development will include approximately 4,000 residential units and over one million square feet of retail and other commercial space. The first phase of the project was approved this past summer with construction expected to begin in 2014. The Howard Hughes Corporation owns, manages and develops commercial, residential and mixed-use real estate throughout the U.S. Our properties include master planned communities, operating properties, development opportunities and other unique assets spanning 16 states from New York to Hawai‘i. The Howard Hughes Corporation is traded on the New York Stock Exchange as HHC and is headquartered in Dallas, TX. For additional information about HHC, visit www.howardhughes.com. Statements made in this press release that are not historical facts, including statements accompanied by words such as “will,” “believe,” “expect,” “enables,” “realize,” “plan,” “intend,” “transform” and other words of similar expression, are forward-looking statements within the meaning of the Private Securities Litigation Reform Act of 1995. These statements are based on management’s expectations, estimates, assumptions, and projections as of the date of this release and are not guarantees of future performance. Actual results may differ materially from those expressed or implied in these statements. Factors that could cause actual results to differ materially are set forth as risk factors in The Howard Hughes Corporation’s filings with the Securities and Exchange Commission, including its Quarterly and Annual Reports. TheHoward Hughes Corporation cautions you not to place undue reliance on the forward-looking statements contained in this release. The Howard Hughes Corporation does not undertake any obligation to publicly update or revise any forward-looking statements to reflect future events, information or circumstances that arise after the date of this release. NEW two-story building for Nordstrom Rack & Pier 1 Imports at Ward Village Shops. The owner of Ward Centers has completed construction of a new two-story building for Nordstrom Rack and Pier 1 Imports at Ward Village Shops. Pier 1 will reopen on Nov. 1 and Nordstrom Rack on Nov. 14 in a 58,000-square-foot complex between T.J. Maxx and the old Pier 1 location on the corner of Auahi and Kamakee streets, which closed Oct. 8. Nordstrom Rack will close its existing store Nov. 9. A more-than-9,800-square-foot Pier 1 and nearly 45,000-square-foot Nordstrom Rack are connected to the existing 700-stall, seven-level parking structure next to T.J. Maxx. The move will give Nordstrom Rack, the off-price retail division of Nordstrom, a larger footprint in Kakaako, expanding the store by 50 percent. 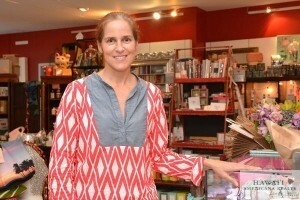 Pier 1’s space is reduced by about 3,000 square feet. The expansion will add about 10 percent more space to Ward Centers’ 550,000 square feet, home to more than 135 shops and restaurants plus a 16-screen movie theater. Howard Hughes Corp., owner of Ward Centers, plans to build 22 high-rise towers and double the retail space at Ward Centers. The developer wouldn’t disclose the cost of the project. However, the company announced in 2011 it had received a $250 million loan to refinance three mortgages and provide $38 million to begin redevelopment at Ward Centers. Howard Hughes plans to incorporate the spaces left vacant by the two large retailers into its redevelopment plan, including a condominium tower on the former Pier 1 site. Howard Hughes hasn’t disclosed tenants that will move in beneath T.J. Maxx. Ward Centers includes Ward Centre, Ward Warehouse, Ward Entertainment Complex and Ward Gateway Center spread over 60 acres on four blocks.